Bridgewater Bay is located at the corner of Orange Blossom and Livingston Road in Naples Florida. 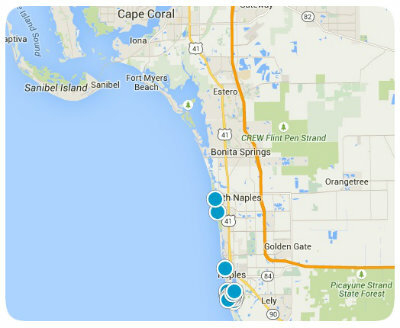 Bridgewater Bay provides a central location within Naples and a luxurious feel for its residents. With over 500 units, Bridgewater Bay provides a range of options, including single family residences, attached villas, and condominiums. The residences within Bridgewater Bay provide an upscale standard of living within a beautifully designed community environment inclusive of community resort style pool and clubhouse. Many families enjoy life within this safe and secure environment. Homes and condominiums favor open floor plans and modern design features, such as large living spaces, screened-in lanais, and split floor plans. Reasonable quarterly HOA fees provide complete maintenance services, and help create a beautiful neighborhood with convenient amenities for Bridgewater Bay residents.